Flooring sound transmittal is an upstairs, downstairs, and everywhere problem. Footfall, music, video, and other noises seep downward to the floor below. Likewise, sound from below migrates through ceilings to the floor above. Even within rooms, various elements such as the flooring, walls, and furniture either deaden sound or act as amplifiers that encourage the noise to bounce around. There are a few floor sound barriers that will mitigate the problem. While none of them make the problem go away entirely, these solutions, ranging from between-floor insulation to foam underlayments, can go a long way toward toning down the noise. To truly block sound, you need to separate surfaces. Any kind of continuous material acts as a type of acoustic bridge that effortlessly moves vibrations from one room to the next room. Separating surfaces is an extremely costly solution, reserved for spaces like home recording studios. Short of that, placing a sound barrier in the plenum, or dead air zone, between the floors is the most effective way available for do-it-yourself homeowners to slow the transmission of noise. This is done is by removing the ceiling drywall and inserting anything from R-13 to R-20 fiberglass insulation in the empty space. Invariably, you need to work around obstacles, like electrical wires and recessed lights that extend into the ceiling. New ceiling drywall is installed. Prior to priming and painting, one option that helps absorb some sound: spraying on ceiling texture, otherwise known as cottage cheese or popcorn ceiling texture. One advantage of this method is unrelated to the noise issue: heating and cooling are better segregated between the rooms, saving energy and money. On the downside, it is an incredibly invasive, dirty, and slow way to minimize sound between floors. 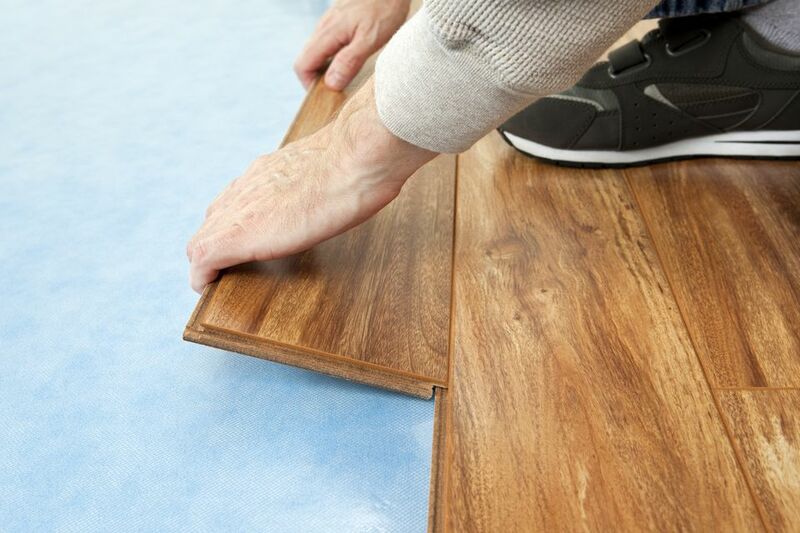 Flooring underlayment is installed primarily to provide a smooth, even, and predictable surface for flooring installation. Underlayment can refer to a soft layer, such as foam or cork, placed on top of the subfloor before installation of the flooring. This type of underlayment is typically installed under carpet or laminate flooring. Alternatively, underlayment can be a thin, hard layer of cement board or plywood. This underlayment may be used under laminate flooring, ceramic or porcelain tile, solid hardwood, or engineered wood flooring. It is even possible to use both types of underlayment in conjunction with each other. Soft flooring underlayments are the type that comes in rolls of typically 100 square feet and are made of foam or cork. Any foam underlayment, regardless of its physical properties, usually will advertise that it is effective against blocking sound. While true, it is important to distinguish between this type of underlayment and others that claim to be acoustic underlayments. One quick way to determine density is to look at a material's weight in relation to its size. Foam underlayment is the least expensive but also one of the least effective products. This type of closed cell foam is easily obtainable at all home centers and comes under many different brand names. SimpleSolutions Soundbloc is one example of this type of foam underlayment. At 2 mm thick, this is the thinnest foam underlayment you can purchase. Beyond the straight-forward foam underlayment marketed for laminate flooring is another, more expensive type that is often called acoustic foam. This is a foam underlayment that is marketed as being effective at keeping floors quiet. WhisperStop is one brand of acoustic foam underlayment and is 3 mm thick, half the thickness of many cork underlayments. The Silencer is another acoustic foam and is fairly dense at 20 pounds of sound-absorbing material per cubic foot. Recycled felt underlayment is both green and effective. About twice as expensive as polyethylene foam, felt underlayment is a wise choice if sound absorption is your main objective and if your budget can handle the added cost. Recycled felt underlayment is about four times heavier than foam and thus denser. This is your best bet with engineered wood and laminate flooring. From 1/4-inch to 1/2-inch AC grade plywood is a popular wood underlayment for laminate flooring, engineered, or hardwood flooring. Plywood is a mildly effective sound blocker. Red rosin paper, which has no sound-blocking advantages, is sometimes laid on top of the plywood to help control moisture. You can do better than plywood underlayment by installing specialized acoustical underlayment on the subfloor. Soundeater is one such product that is made from 100 percent recycled wood. At 1 1/16-inch thick, Soundeater is thicker than most ordinary plywood products, so make sure that this does not cause a problem with floor levels in adjacent rooms. Acoustic underlayment systems differ from the straight plywood option because the systems elevate the flooring on sleeper boards. This elevation creates a dead air zone that significantly reduces the transmission of vibrations from one floor to the next. WonderBoard and DuRock, two popular types of cement board, are used as a base for tiling. Cement board is a better sound-blocker than wood because of its dense mass. In the end, no single solution will cure the problem. An aggregate of methods such as adding area rugs or switching out hollow core doors for solid doors is your best bet for reducing noise. Underlayment alone will not fix the problem. In fact, some types of underlayment such as foam are so ineffective that it is not worth pulling up an existing floor in order to put down the underlayment.